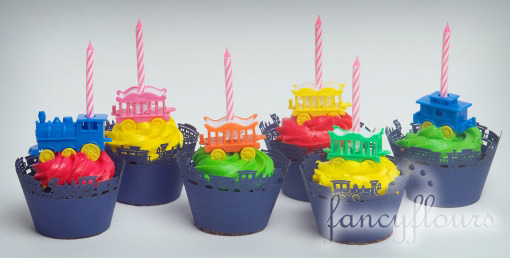 Give your next birthday bash an extra cute touch with cupcake wrappers. They are easy to use and have a stunning effect! Fancy Flours carries nearly 20 different designs- perfect for any occasion! 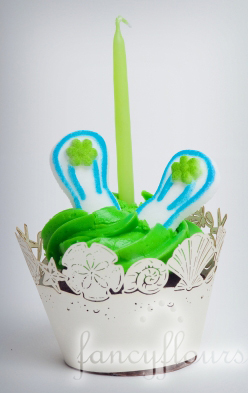 Cupcake wrappers simply wrap around any standard-sized cupcake (a tab on the back holds it together). You can even use them again if you are careful not to get icing on them. If your cupcakes need a kick- try cupcake wrappers for a little pizazz! BULK PRICING is available on select cupcake wrappers. Please call fancyflours.com for pricing information @ 406.587.0118. This entry was posted in Birthday Baking, Cupcake Recipes & Ideas by Fancy Flours. Bookmark the permalink. Do you have a catalog? Do you sell wholesale? I own a bakery & am interested in some of your products. Do you have a catalog? Do you sell wholesale? am interested in some of your products. I am in Australia and I am interested in wholesaling your cupcake wrappers. Would you be interested? Hello! Bulk Wrapper prices are available! Please call fancyflours.com and speak to one of our customer service reps @ 406.587.0118.
i am thinking about starting my own cupcake buiness. i want to use all wraps for my cupcakes. i have my own designs or ideas for wraps but i need someone to make the designs can you do this. I have bought from your company and i love what you have however I was wondering do you sell wholesale.